Getting back into routine after the summer holidays can be as much as a challenge (if not more) for the parents than it is the kids. After forking out a small fortune on children’s clothing, you suddenly realise nothing’s labelled. You ask your child to dress themselves and find, 10 minutes later, that they have their shoes on back to front. And what’s worse – the dog’s sneaked your toast whilst you were desperately scrambling about, trying to assemble something that vaguely resembles a packed lunch. It’s time to change your morning madness to a more streamlined and serene family morning with the kids; and we have the best back to school household hacks to show you how! 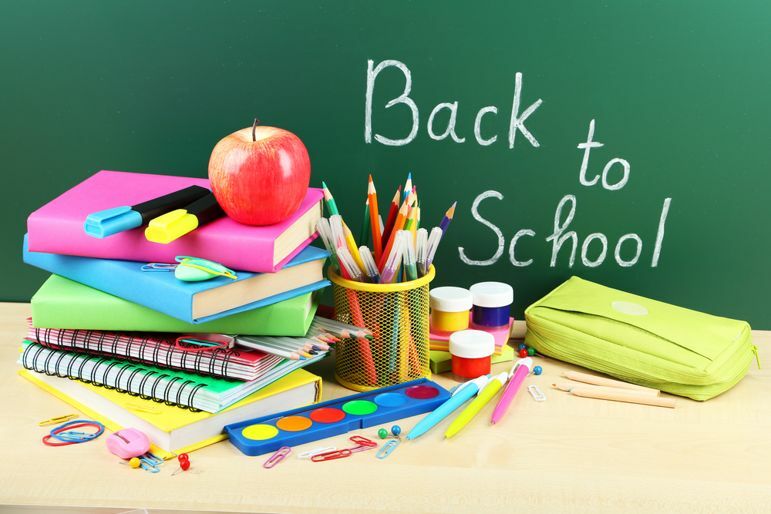 Ensure your child has fresh underwear, socks, a pen, pencil, and any paperwork they may need such in check. 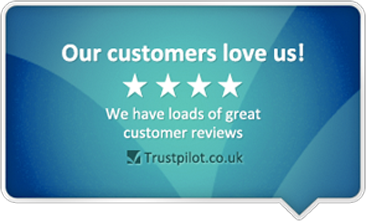 So why not invest in stacked organiser drawers which are labelled for each day of the week, containing the essential they need every day before school. Make sure you double check the drawer before they leave for school and replenish it when they return. Hopefully, your child won’t need a countless stream of pens and pencils, however, with that said, children are notoriously good at losing things! 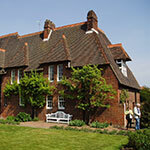 It is important they are prepared for school in order to perform well at school. And, let’s face it – you want to look like you can keep everything in check! 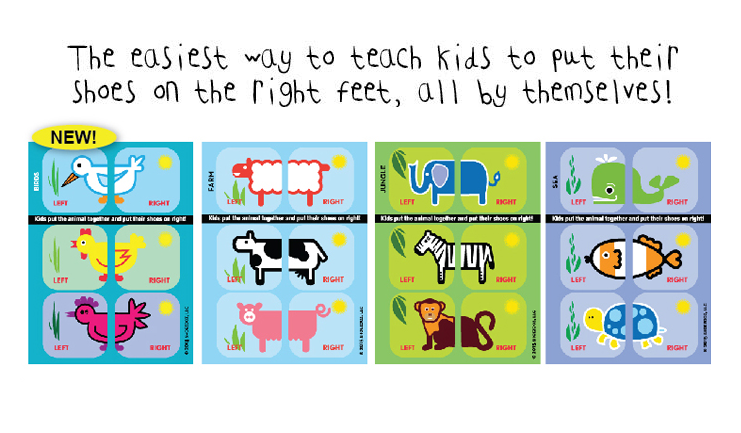 For younger children, a fun idea to help them identify which shoe is meant for which foot; is stickers! Simply cut a stick in half and place one half in each shoe, so your child can match up the stickers to make the image and have the correct shoe on each foot every time! It’s swimming practice and all girls are required to have their hair tied back. 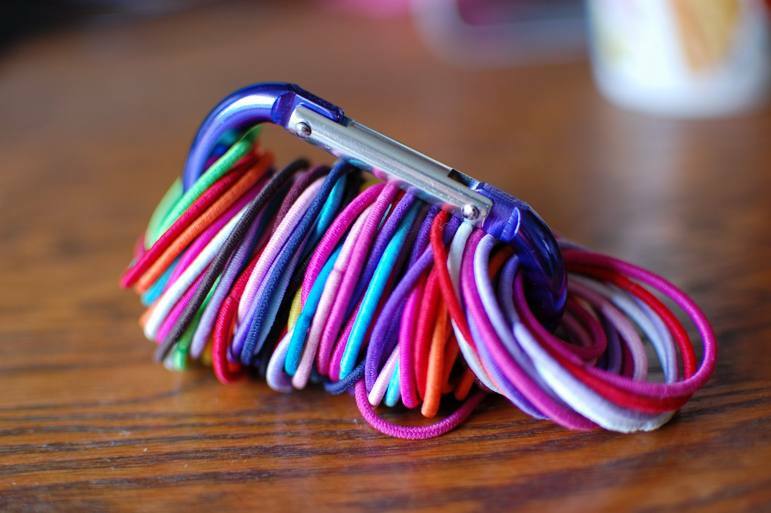 If you’re the type of person who’s always rummaging trying to find a bobble to tie your child’s hair with; try using a Carabiner. This way, you’ll never been in a mad rush, checking under sofa cushions or through piles of clothing! And your child will never have to endure the discomfort of an elastic band in their hair – ouch! Forgotten about sewing in your child’s name tags? Thanks to the competitive nature of online suppliers; next day delivery is usually not a problem if you’ve forgotten your child’s name tags for their school uniform and P.E. kit. And, as a temporary measure (or, if you simply don’t fancy sewing all evening! 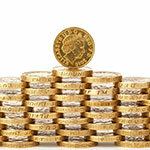 ), sticker labels are now available from many online retailers such as Ebay or Amazon. These little tags are also great for lunchboxes, stationary and other personal belongings. 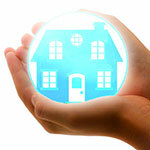 They are also easily replaceable should they begin to look a little tired or worn after time. 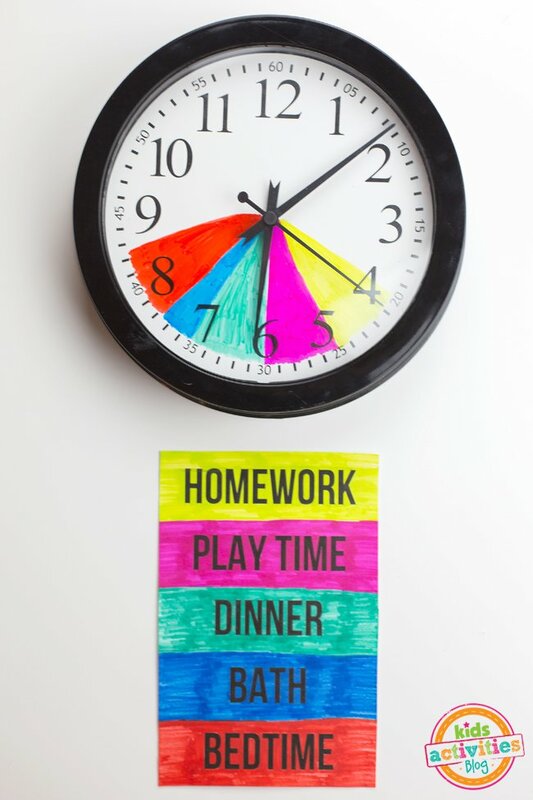 Prevent evening tantrums with this novel colour-coded clock. Children can happily distinguish between how long is spent for their evening activities by looking at the short hand of the clock. 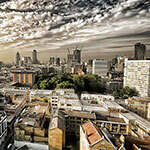 Parents can even choose to have a small section coloured in to identify certain tasks. 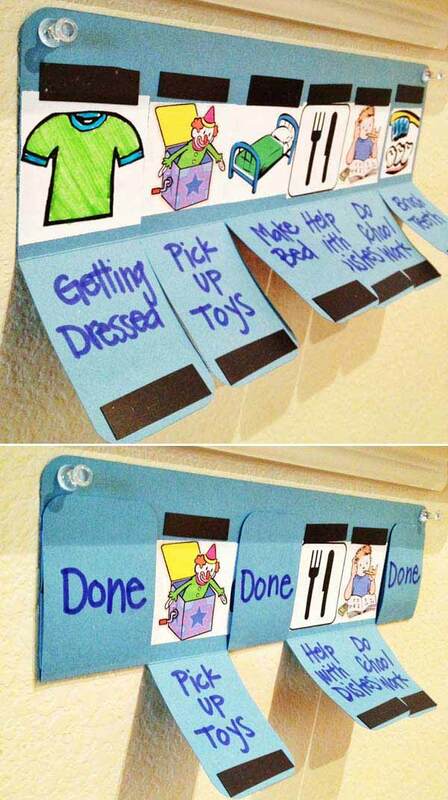 A similar idea involves labelled cards showing younger children their daily chores. Once completed, they can flip the card tab back up again to reveal the word ‘done’ written on the other side of the card. The cards can be hand-made and can be sealed together with sticky-backed magnetic strips or sticky-backed Velcro strips. Once parents are back at work and arguably have less time to be heading out to interesting destinations with the kids; children quickly become bored. Designated family time is important in the evenings however; it is also important that your child has the ability to entertain themselves whilst you’re preparing dinner. When preparing hot foods, having a young, sulky child getting under your feet is neither practical or safe. 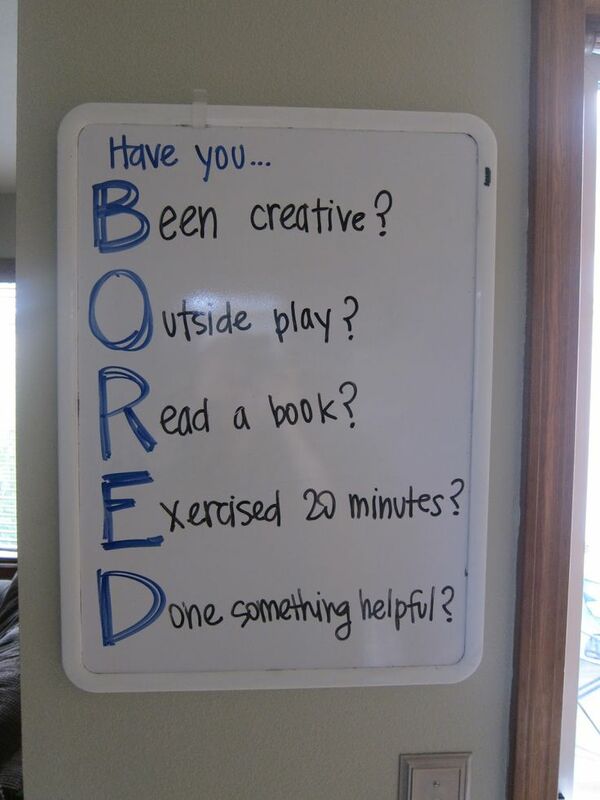 This simple ‘bored’ acronym is an effective way of buying valuable minutes when trying to get on with essential tasks. 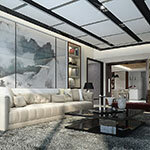 Streamlining your mornings and evenings will allow for more quality family time and relaxation time. Organisation is key to reducing stress, gaining time and avoiding last-minute disasters – who knew your child’s science project was due this morning? 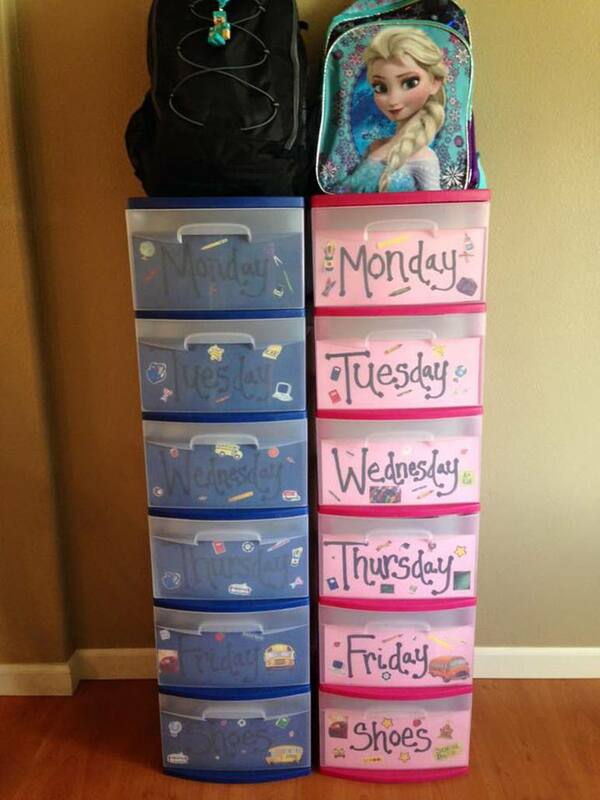 Being organised also sets a good example to your children; and this will serve them well in later life.